The control of light by light is one of the main aims in modern photonics. In this context, a fundamental cornerstone is the realization of light-written waveguides in real time, resulting in all-optical reconfigurability of communication networks. 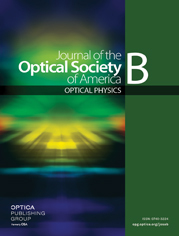 Light-written waveguides are often associated with spatial solitons, that is, non-diffracting waves due to a nonlinear self-focusing effect in the harmonic regime. From an applicative point of view, it is important to establish the temporal dynamics for the formation of such light-written guides. Here, we investigate theoretically the temporal dynamics in nematic liquid crystals, a material where spatial solitons can be induced using continuous wave lasers with a few milliwatts of power. We fully address the role of the spatial walk-off and the longitudinal nonlocality in the waveguide formation. We show that for powers large enough to induce light self-steering the beam undergoes several fluctuations before reaching the stationary regime, in turn leading to a much longer formation time for the light-written waveguide. » Visualization 1 Simulated temporal dynamics of spatial soliton formation from t = 0 s (switching time of the input) to t = 1 s. The intensity on the plane yz is plotted (an effective bidimensional model is used). » Visualization 2 Simulated temporal dynamics of spatial soliton formation from t = 0 s (switching time of the input) to t = 1 s. The intensity on the plane yz is plotted (an effective bidimensional model is used). » Visualization 3 Simulated temporal dynamics of spatial soliton formation from t = 0 s (switching time of the input) to t = 1 s. The intensity on the plane yz is plotted (an effective bidimensional model is used). » Visualization 4 Simulated temporal dynamics of spatial soliton formation from t = 0 s (switching time of the input) to t = 38 s. The intensity on the plane yz is plotted (an effective bidimensional model is used). » Visualization 5 Simulated temporal dynamics of spatial soliton formation from t = 0 s (switching time of the input) to t = 30 s. The intensity on the plane yz is plotted (an effective bidimensional model is used). » Visualization 6 Simulated temporal dynamics of spatial soliton formation from t = 0 s (switching time of the input) to t = 55 s. The intensity on the plane yz is plotted (an effective bidimensional model is used).